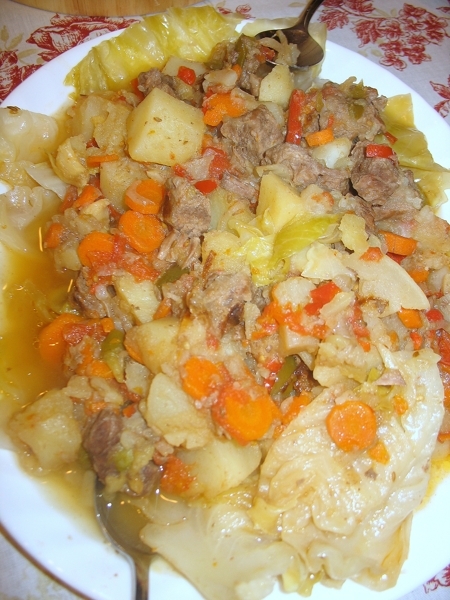 Dimlama is an Uzbek stew made with various combinations of meat, potatoes, onions, vegetables, and sometimes fruits. Meat and vegetables are cut into large pieces and placed in layers in a tightly sealed pot to simmer slowly in their own juices. Vegetables for dimlama may include, in addition to potatoes and onions, also carrots, cabbage, eggplants, tomatoes, sweet peppers, spiced with garlic and a variety of herbs and condiments. Dimlama is usually cooked during spring and summer when there is a wide choice of vegetables. It is served on a large plate and eaten with spoon. I am going to share the recipe my father used to prepare this delicious dish. The best dish for preparing dimlama is cauldron with a flat bottom with volume 5L. Smear the bottom with 1.5 Tbsp butter. Spread 1/3 part of sliced onions on bottom. Select most fatty pieces of meat- the half of all meat. Spread them on top of onions with the fatty part on the bottom. Spread the next 1/3 part of onions on top. Add 0.5 tsp of salt, pepper if you want and cumin seed. Spread half of tomatoes on top. Add turnips on the next layer. Add bell pepper on top. If you want you can add sliced beet, it will change the color of the dish. Add the layer of the rest meat and onions on top. Add the layer of potatoes. Add the rest of tomatoes on top. Cover the top with cabbage leaves so there is no space for steam. Cover cauldron with lit. Put on low heat. After 5 mins increase heat till medium. Onion and meat begin exuding, liquid evaporates, steam heats higher layers making them to exude, liquid flows down and process is repeated again. After 15-20 you can hear boiling sound at the bottom and the lit will be hot. If cauldron is hot but there is no boiling sound, meaning that meat and onions are not exuding for some reasons add couple of spoons of water. The dish is stewed for 2 hours. Check periodically in case liquid evaporates to add water. But usually it is ok without additional water. Serve prepared dish in large plate with high sides, as it consistency looks like soup. Put cabbage leaves at the bottom of dish side. Put the rest on plate, you can mix everything in cauldron or put as it is. Pour with liquid on top. Eat with spoons. That was incredibly good. Everything is so soft and tender, you just can't stop eating it! 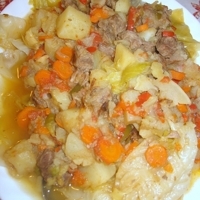 If you love the mix of comfortable flavors and seasonings in a great corned beef and cabbage dish, then you will love this stew from Uzbekistan. It is really delicious and perfect for a cold winter or fall evening! I love this recipe! Thanks for sharing! This looks great - alot like a "Potjie" which is a traditional South African pot where you layer things and then let it cook over the coals. I'll give your version a try assap!